Do you need protection from co-workers at the office? Like to terrorize your better half or pets? Or just want something to turn off the lights without getting up? Nerf has got you covered. The N-STRIKE NITE FINDER EX-3 is a great single shot gun, that includes a light beam that is accurate from 15 ft. So shoot in the dark or the day, this gun doesn’t take sides. 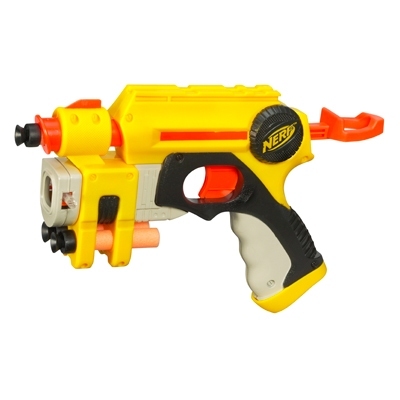 Make your co-workers envious and fearful of your Nerf wrath. This entry was posted in Gifts and tagged Darts, Nerf. Bookmark the permalink. great for terrorizing wives also! but it sounds like this Liz person speaks from experience?! you need one of these for the cave! !